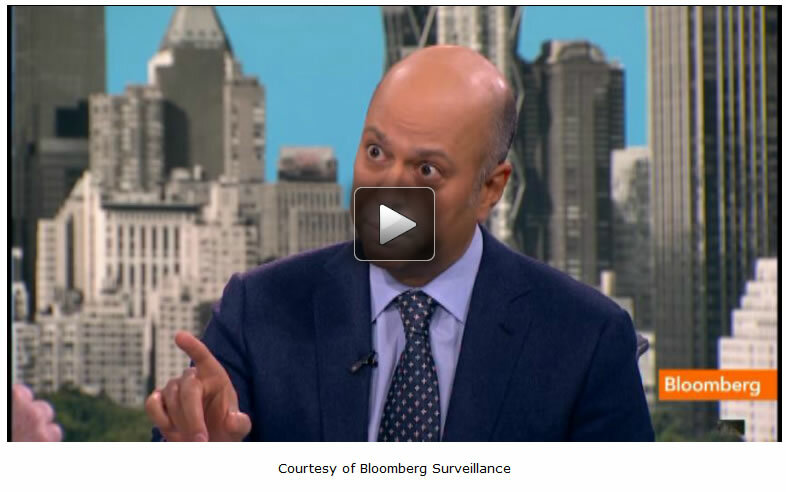 Lakshman Achuthan, co-founder of the Economic Cycle Research Institute, told Tom Keene and Sara Eisen on "Bloomberg Surveillance" this morning that a U.S. recession "began around the middle of last year. Achuthan said, "the entire West is in the yo-yo years. They have all been having growth stair stepping down. It is very weak growth with higher cycle volatility which will give you more frequent recessions." "That is a concept we do not use that often. The Fed uses it because they are using models. We do not use models. We use leading indicators. The Federal Reserve board in 2011 came out with a study examining the idea of stall speed, you look at GDP and gross domestic income, the counterpart, which should statistically be actually the exact same thing. When they looked at all the different measures, they found that the two quarter annualized GDI growth rates going below 2% was a signal of an economy slipping into recession. When you look at that measure now, what you see is that in the second quarter of 2012 it fell below 2%. It went to 1.5% and then in the third quarter, it fell further to 0.4%. By last fall, when the unemployment rate was plunging and people did not believe it was plunging and then the Fed came out and said, hey, we will give you q-ternity...It kind of makes sense in the context of their own recessionary stall speed." "I think that a recession began around the middle of last year. The reason I think that is because number one, the stall speed and GDI last year, and also when you look at the weakness in the indicators that define a recession -- output and income and sales -- initial jobless claims are not used to define recession. You actually use overall employment payroll or household employment, and there, if you simply look at year-over-year growth rates, what you see is they are falling. Right now on the Bloomberg I think the consensus is 160-170 for tomorrow. Even if that is true, you are going to see year-over-year payroll jobs growth go to a 16-month low. It's going the wrong direction. The headlines say jobs are improving but they are actually going down." "I think some facts, right? I am pointing out that the GDP number that you have from Q4 is recessionary. Central banks are now going to be targeting nominal GDP fairly soon, right, because in theory, they could impact the cash economy. You see nominal GDP growth by Q4 year-over-year at 3.5%, even with your marginally higher revision. Any time in the 65-year history of GDP growth it has been below 3.7, you have been inside a recession...The other thing is, you are not in a 2% economy. Everybody keeps saying it, but just because you are saying it does not mean it is true. You're in weaker than a 2% economy." "Economies do not hang out at 0.5% or 1%. They do not get this low growth steady state muddle through recession-free kind of growth at 1%, which everybody seems to think might be possible. It is not possible. Free markets have economic cycles. they accelerate and they decelerate. if you are doing it at a very low growth rate, the odds of a slowdown going into recession are very high." "No, I'm not, but the entire West is in the yo-yo years. They have all been having growth stair stepping down. It is very weak growth with higher cycle volatility which will give you more frequent recessions. Did anyone notice that in q4, it's the G6, Canada did not report. They all contracted? This is after $11 trillion worth of stimulus." "How do we explain it? We called it. We called it back April 2012. We said there was a home price upturn. But that does not preclude a recession. In 2001 you had a home price upturn and we actually had a recession." "I think, no. Look, when we call a recession we will be associated with recession. That is fine. That is what we do. We don't call the market. We call the business cycle. I think people forget it is not easy to recognize it recession when it is happening." "Here's the thing. In 80% of the last 15 recessions you have had an associated bear market. That is why if you hear the word recession, you say, oh my gosh, we have to run to the hills in the equity market. But in three out of those 15 recessions, we had stock prices rise through the recession. You did not have an associated bear market. That is 1980, a pretty short recession, 1945, coming out of World War II, and 1926-27, which was smack dab in the middle of the Roaring 20s. Avery different economy, a very different market, but to say that stock prices cannot rise during a recession is actually not true." "All the growth rates are coming down in our broad indicators. Look, let's be clear -- the Fed told you they are targeting financial assets as part of their monetary policy. They have specifically called out people's 401k's as something that they are looking to target. So, I submit perhaps some of the market prices, as they pertain to economic fundamentals, may be a little wacky, which is why when we look at leading indicators, we do not have all eggs in one basket."